10.5: How Do You Calculate Fees If You Have Less Than A Full Caseload? When using the ‘pay for results’ system, how do you calculate your fee for services? In this appendix we’ll cover the simplest, least risk method that charges your clients the minimum possible fee while still meeting your financial goals. In reality, most therapists in general practice who use the ‘pay for results’ model simply use the same standard, set fee for every ordinary therapy issue. Essentially, "one size fits all". No matter what problem the client has, they charge the same amount. Flat fee billing minimizes financial risk for the therapist, because risk and reward are spread evenly among all clients. Typical minimum fees for general therapy range around $250 - $350US, but vary with country and cost of living. Interestingly, in our experience most ‘pay for result’ clients are fine with a fixed fee – they are only really concerned with eliminating their issue. (It is generally just therapists or other ‘healthcare practitioners’ who have a problem with this billing method.) Clients recognize that they are paying for your expertise, not your time. In fact, for them shorter is better – clients are tired of suffering and just want the issue gone as rapidly as possible. Like with car repair, clients are happier if it’s done in an hour rather than a day. Quoting a fee in advance also allows them to evaluate the cost/benefit and budget for their treatment. Again, since this is ‘pay for results’, their chief worry that they are going to waste a large amount of money for nothing is no longer an issue. This fee structure also means that half of the clients are charged less, and the other half more, as compared to an hourly rate fee system. This really helps the slower clients and is not an excessive burden on the faster ones. Figure 10.1 shows this relationship on the graph below. Figure 10.1: A plot of the fixed fee (equation 10.1) for four different hourly rates. Estimated annual incomes were computed assuming 660 contact-hours per year. Figure 10.1 shows the relationship between fixed fee versus hourly rate from equation 10.1. The plot’s name ‘burdened treatment time’ means this average also includes the time spent on clients we did not succeed in healing, as well as time spent in all initial interviews. It also assumes a full client load. Nothing says you have to charge your standard, fixed fee if the client's issue was handled quickly, meaning you could charge less if you wanted to - but you have to watch out, as your income depends on having some clients heal quicker to make up for the ones who heal more slowly! A fixed fee of about $350US is a reasonable estimate for a typical beginner using subcellular psychobiology techniques. Over time, you can use equation 10.1 and adjust your fee to better fit your skill level and client issues. So how did we get a $350 beginners fixed fee? Here are the (hopefully) reasonable parameters we used. You want a $50,000US/year income and you work 660 client contact hours a year, which means you need an equivalent hourly rate (R) of $76/hr. Your average diagnosis time (T) is 0.5 hours; your average general therapy treatment time (A) is 2 hours; your maximum cutoff time (C) when you should quit is 4 hours (we’ll explain that later); the percentage of clients who start treatment after your initial interview (Pt) is 80%; and your success rate (P) on the ones who start is 70%. Thus, in terms of figure 10.1, you have 4.6 total contact-hours per healed client. Given these numbers, you would have to work on 256 clients in a year, which means you have to see 6 new clients each week (if you work a 5-day work week with 15.2 client-contact hours per week spread out over 217 work days for 43.4 weeks a year). If you can’t get that many new clients, you’ll have to either accept a lower annual income (e.g., for 10% fewer clients your income would be 10% lower) or raise your fee to compensate (e.g., for 10% fewer clients you raise your fee 10%). The simple equation 10.1 says that to figure your fixed, ‘one price fits all’ fee, all you have to do is keep a running total of the time you spent on all your clients, while keeping track of how many you were actually able to heal. The only thing you need to know ahead of time is your desired hourly rate R (say $75/hour). As the weeks pass, you just keep adding to these totals to make sure your fee is about right. We can also rewrite that equation so we can make sure our desired hourly rate is holding steady. Simple, eh? Actually, over time your success rate increases and then plateaus as you become more skilled; and continues to bump up as new techniques are developed and subcellular cases are identified. If you are a beginner, therapists we’ve trained to use subcellular techniques quickly improve during their first 20 clients. Thus you find you can decrease your fee yet still meet your hourly income target. Experienced therapists get more capable but often start accepting (or attracting) tougher clients that take longer. Thus, their increased speed can be counterbalanced with harder clients, sometimes requiring a fee adjustment to keep their equivalent hourly rate on target. As a therapist with a private practice, you need to decide how many client hours you want to do per week. You also have to account for time you have to spend on the business (making calls, appointments, advertising, chatting with potential organizations, keeping records up to date, billing insurance, paying bills, etc.) If you work a full 8-hour day, it is reasonable to assume 2 hours a day for these other tasks. Time off is another issue. You need time off, and the clients often don't come in during certain periods of the year. For example, summer months and the month after Christmas are unlikely to have a full caseload. Thus, although it varies widely, the most you can probably expect is 10 months of full-time work at 30 hours per week of patient contact time, and 40 hours per week total work time. Thus we work about 217 days or 43.4 weeks at 5 days per week. This gives a maximum of 1,320 contact hours - and more likely you'll have a lot less contact hours, because you probably won't have a continuous back-to-back stream of clients. Figuring on a half-time caseload is probably a reasonable maximum estimate (although it may be a lot less especially when you start out). With this estimate, you'll only have 660 client-contact hours per year doing private practice (with another 220 hours for other tasks). This number is low for a therapist employed at a facility, but probably realistic for a therapist in private practice. If we work about 660 contact-hours per year, this means we have about 3 contact-hours per working day. (Figuring another 220 hours per year for other tasks, this means a total of about 4.1 hours per working day.) This half-day schedule is not unreasonable, because the number of clients who want our services is usually the limiting factor, and this trauma-healing work is very demanding on the therapist. It also allows the trauma therapist to run overtime far more easily, something that happens a lot with this work. It also allows the therapist to work longer on weeks with a lot of clients, and shorter on weeks where there are fewer clients. Example 10.2: What should my equivalent hourly rate be? Because your practice is new, you decide that your base rate should be in the middle of the range of psychotherapy fees in your area. This turns out to be $75/hr. If you figure a half-time caseload and the same average equivalent hourly rate R of $80 per hour, you can expect a gross annual income of $75/hr x 660 hrs = $49,500. This appendix was written to allow you to get a feeling for what you will earn based on a simple, ‘one hourly rate for everything’ model that most ‘pay for results’ psychotherapists use in general practice. In other words, the formulas assume that you are charging the same equivalent hourly rate R for all client issues. However, if a general practitioner also occasionally treats some specialized, particular issue – for example, eliminating schizophrenic ‘voices’ – they might use a different, higher fixed fee for just that particular problem, especially if it is a pre-defined, standard but time consuming process. Essentially, it is in a time category of its own and should be billed as such. Also, some of the unique services that a certified Peak States therapist can offer (such as peak state processes or treatment of ‘untreatable’ conditions) are far more valuable to clients than standard therapy and can be billed at a higher rate. Although this may sound rather mercenary, you’ve spent a lot of time and money learning this cutting edge material that can help your clients when nothing else can – and the client can decide if the cost is worth it for him. And remember, you don’t have a monopoly, since the Institute is doing its best to spread this new way of working as fast as we can. Thus, your client can simply ‘vote with his feet’ and find another certified therapist whose fees are more reasonable, after all. Experienced therapists generally move into a specialization that they feel passionate about. This can make it much easier to get the needed stream of clients, especially if the therapist can work over the internet, gets referrals for their specialty, or has more than one office location. Specialization also usually pays better than general therapy (experts charge more for their expertise and training) and allows longer treatment time without increasing financial risk. The fixed fee structure is especially appropriate for therapists who are primarily specialists. They usually set higher than average fees for their work; and since a specialist can accumulate experience in predicting the duration of their treatments, it is also far easier for them to vary their prices to fit the client’s issue if they choose to. Specialists also do a better job (higher success rate) in their area of expertise than a general therapist; and most importantly for long-term job contentment, they wake up looking forward to working and having more fun! It has to do with how long you spend trying to heal clients before you give up. You know that some clients are just not going to heal, usually because the state of the art is just not yet good enough to help everyone. So the longer you spend with these clients, the more time you waste not earning any money or treating the clients you could help. Since these impossible clients don’t come with little signs on their chests – they’re mixed in with the ones who you can actually help - how do you deal with this? The answer is to have a ‘cutoff time’. This means that you quit trying to help your client if the total time you’ve spent with them goes past this limit. Thus, the other essential part of setting your fees is to pre-determine when to quit and accept that you can’t help your client (nor earn a fee). OK you say, but how to pick it? Well, it turns out that the cutoff time you choose has a real impact on your fee. Too short, and you have to charge way too much to account for all the clients you cutoff. But too long and again you have to charge way too much to account for the many hours you wasted on clients you couldn’t help anyway. So there is a ‘sweet spot’, a cutoff time just right for you that makes your fixed fee as cheap as possible while at the same time giving you the best equivalent hourly rate (your average earning in dollars per hour of client-contact time). But doesn’t the cutoff idea mean that some of your clients might still have healed if you had just kept going? Is this ethical? First, very few clients slip through (only about 8% or so based on a Gaussian distribution). But regardless, you don’t just dump the clients you can’t help into the street! You pass them on to specialists who work with the tough cases, such as our Institute clinic staff. This means you need to network with your colleagues to find out who has a hope of helping these more difficult cases. Generally, if the specialist succeeds in treating your client, he shares some of his earnings to you for the referral, a win for all three of you. One final point - as you become more experienced, you begin to recognize during your diagnosis the clients who you know you simply can’t help. For example, perhaps they have a disease you don’t know how to treat, say OCD, and are not interested in paying for what you can treat, perhaps a reduction in feelings about having the problem. Thus, with time your overall treatment speed and success rate increases because you know when to not even try. In the next section we’re going to cover how to choose an ‘optimum’, statistically derived cutoff time – but that doesn’t mean you have to use it! Say for example you want to always try and help the few clients who take a lot more time than usual; Equation 10.1 and 10.2 will still allow you to calculate the required flat fee. Your income may now wobble a bit more than if you’d use the optimum choice, but probably not by much. And your fee may have to be higher than it would be if you’d optimized, but again, probably not by too much. Or you may just want to skip all the measurement jazz and just arbitrarily pick parameters you think seem about right. You can still compute a fee, and then over the next month or so adjust it to fit real life. Many experienced therapists already have a good feel for when they need to give up trying to heal a client. However, beginners and even experienced therapists can benefit from knowing when the statistically derived cutoff time to quit is, to help them understand the instinctive time tradeoffs they are making. Of course, you can use any cutoff time, and compute fees to match, but this little process usually helps you get close to your ‘sweet spot’. One mistake that is easy to make – this cutoff time does not include your diagnosis time. The cutoff clock starts when you start treating the client. Think of diagnosis as a completely different activity, even if you launch into treatment right after finishing the contract. Record the times it takes you to heal the next 10 successes you have (more is better up to 20 - but 10 is usually good enough). For the tougher clients, work with them an extra hour or so more than you would have normally before you give up; this gives the math better data. Also record the times it took to do diagnosis on everyone who came through the door up to the last client you healed successfully. Example 10.3a: You’ve recorded all your diagnosis times in minutes: 25, 35, 40, 26, 37, 22, 40, 28, 38, 15, 17, 50, 28, 40, 20. You’ve recorded your treatment times in hours: 0.5, ∞, 4.0, 1.5, 2.5, 1.0, 3.0, 1.5, ∞, 2.5, 2.0, 2.5. The infinity symbols are for those clients you just couldn’t heal. Use a calculator or web program that gives you the mean (m) and standard deviation (s) of the treatment times you recorded (not the diagnosis times). Use the ‘sampled standard deviation’ if it gives you a choice. The ‘ideal standard deviation’ is close enough if it doesn’t. For this calculation, you ignore the clients you couldn’t heal. Example 10.3b: The hand calculator gives a value of m=2.1 hours, and s=1.02 hours on the 10 treatment times. Using a ‘rule of thumb’, the cutoff time C = m + (1.35 x s). This is an average that doesn’t quite fit every case, but is close enough for most therapists. (2) when most of the clients take about the same long length of time and not many heal fast (a negatively skewed distribution), use C = m + (1.5 x s). Example 10.3c: C = 2.1 + 1.35 x 1.02 = 3.48 hours. Rounding to the nearest tenth hour, C = 3.5 hours. Since we have very few slow healing clients, we try the more exact formula: C = 2.1 + 1.02 x (2.04 x 9/12 – 0.13) = 2.1 + 1.02 (1.4) = 3.53. The difference is negligible. Add up all of the diagnosis times for every client that walked in your door (= Td). Note the total number of people that walked in the door (= Na). Example 10.3d: You converted that to hours, and added them up. Td = 7.69 hours. The number of people who walked in the door Na = 15. For fun we compute the average diagnosis time T = 7.69 ÷ 15 = 0.513 hours, not too bad but it could be a bit faster with more experience. Example 10.3e: Now let’s add up all the times. We already did the total diagnosis time in step 2, so we know Td = 7.69 hours. Now we’ve got to add up all the treatment times, so Ttreatment = 0.5 + 1.5 + 2.5 + 1.0 + 3.0 + 1.5 + 2.5 + 2.0 + 2.5 + 3.53 + 3.53 + 3.53 = 27.6 hours. Notice that we remembered the tricky bit and replaced our client with 4.0 hours with the shorter cutoff time, and also replaced the 2 we couldn’t heal at all (those were the ones which we recorded as ∞) with the cutoff time. 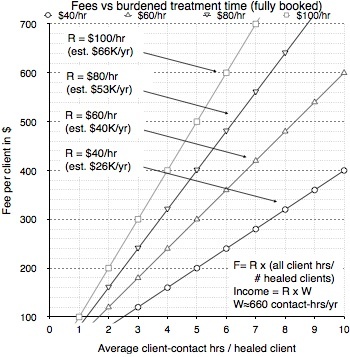 From equation 10.1, your fee F = (equivalent hourly rate) x (total of all client hours) ÷ (# clients healed). Example 10.3f: Let’s assume you want to earn $75/hour (a yearly income of about $50,000). Putting this all together, F = $75 x (7.69 + 27.62) ÷ (9) = $293. From equation 10.5, and using 660 client contact hours per year, our required number of new clients per year is your forecast annual contact client hours divided by the average time you spend per new client. Thus, NY = (W x Na) ÷ (Td + Ttreatment) – that’s equation 10.5. Example 10.3g: NY = (660 x 15) ÷ (7.69 + 27.6)] = 660 hours/year ÷ (2.35 hours/client) = 280.5 new clients per year. For 43.4 weeks per year, this means you need 280.5/43.4 = 6.46 new clients per week. At this point, all the steps for Example 10.3 are finished and nothing more is needed. But for those somewhat more interested in math, the steps you did for example 10.3 (as well as fees and incomes for other cutoff time choices) are illustrated graphically below. The computations of the mean and standard deviation in Step 2 for Example 10.3b are plotted in Figure 10.2 below. The statistically optimum cutoff time for Example 10.3c is shown at about the 1.4 sigma point on the graph. 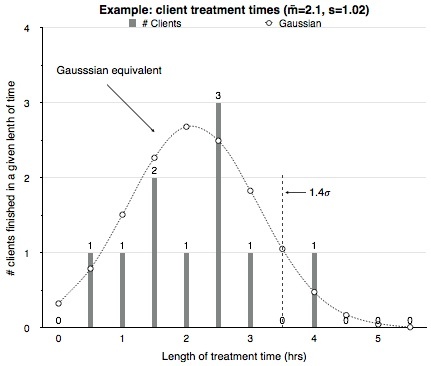 Figure 10.2: (a) From the example data is a frequency plot of the 10 client treatment times. Superimposed on this plot is a Gaussian curve with the same mean and standard deviation. The statistical optimum ‘sweet spot’ cutoff point is shown as a dashed line at 1.4 sigma. In Step 6 of Example 10.3f we computed the fixed fee we need to quote to clients for the statistically derived cutoff time. But we can also compute the fees and the equivalent hourly rate we would get with the data that we actually measured for every possible cutoff time. This is shown in Figure 10.2.b below. It is interesting to be able to see visually that the lowest client fee gives the highest hourly income over the range of cutoff times. Notice that the statistically optimum choice for cutoff – the ‘sweet spot’ - fell in a dip. This was probably due to the small sample size; we would anticipate that with more clients, the curve would ‘smooth out’ and make this choice closer to optimum. Also note that for this particular client distribution you could pick a cutoff anywhere from 3.5 to 4.0 hours and get nearly the same financial results. Using the longer time would also let you finish healing a few more percent of your clients; or you could vary the time somewhat when you actually quit working with a given client and still get about the same financial return. Past the 4 hour point, your failure rate (the percentage of clients you cannot heal) causes your income to drop (for a given fee) - and if your failure rate was worse that the 17% we used in this example, that drop (with respect to cutoff time) would be faster and more severe. The figure also includes the results of Step 7 for the number of clients per week (for 660 client contact hours per year) you would be treating for a given cutoff time. Notice that the number of clients is roughly the same per week for reasonable choices of cutoff times. 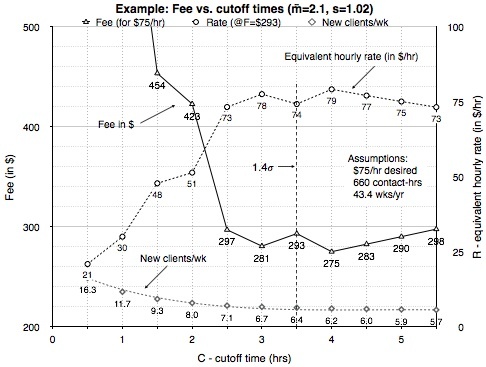 Figure 10.2: (b) For example 10.3 we show plots of fee (for an equivalent hourly rate of $75/hr), equivalent hourly rate (for a fixed $293 fee), and new clients required, all for different choices of cutoff times. Up to this point, the fee formulas in this appendix all assume you’ve got a full case load. Unfortunately, this may not be true for typical trauma therapists. In this section we’ll look at this issue. Probably the biggest surprise for new therapists is how many more new clients they will have to see to earn a living. This is due to the fact that with the newer trauma therapies – and even more so with the new subcellular biology techniques - clients are either healed quickly or you soon realize that you can’t help them. Hence, turnaround is quite fast and therapists have to see a lot of new clients to fill up their open time slots. So what do we do if we just can’t attract that many new clients consistently? Working with another institution that sends you clients in your specialization is by far the best answer. Or simply specialize and focus on what you really care about, where you can charge more for your unique contribution to your clients’ lives. But given that you don’t have an institutional affiliate and still work as a general practitioner, you will either need to raise your fees to compensate, accept that you’ll be earning less annual income, or get a second job. The other option is just to accept that you have an ebb and flow in your practice. The fee you’ve calculated ignores any missed appointment slots – so if you have a client, that is the right fee, and if you don’t, you don’t try and make it up by charging more; you just wait till you do get another client. Perhaps you simply work more hours in weeks that you have a lot of traffic in the door. Of course, you still need to pay the bills, so you need to keep track of your hours and income to see if you are meeting your financial goals. To put this issue in more easily grasped terms, we can express NY in the more meaningful ‘clients per week’ by dividing it by the number of weeks we work. That’s just the number of new (or repeat) clients that we need to have every week. As covered in section 10.3.1, if we assume you are in private practice and take about 2 months off (during times that most clients are not seeing therapists anyway), we work 217 days or 43.4 weeks at 5 days per week. Of course, you particular circumstances might be different – we’ve shown these simple formulas so you can just plug your numbers into them and compute results for your own situation. If you decide you are going to raise your fees to compensate for a lack of clients, the adjustment to your fee is simple – the percent change to the optimum clients is also the percent change to the optimum fee. In other words, if you’ve got fewer clients, your fee has to go up by the same percentage. 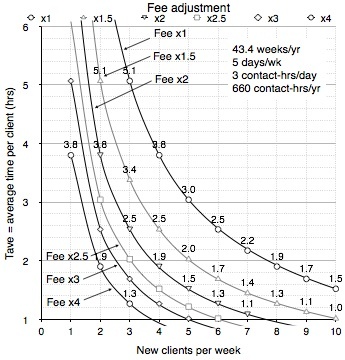 The same holds true for time – if you’ve scheduled for 15 hours of client contact time per week, but on average only use 10 of those hours, your fee is going to have to increase by (15-10)/15 = 33% to compensate. Figure 10.3: Plot of how much you have to multiply your fee if you don’t have a full client load (or get a lower income instead). The upper right curve is for a full case-load at 660 contact-hours per year. Figure 10.3 illustrates the magnitude of the problem of needing new clients. You’ve optimized your fee for a full workload. Say your average time per new client (including diagnosis) is a fast 2.5 hours. This means you need to see an average of 6 new clients a week, every week you work that year to stay busy (the full client-load line is labeled Fee x1). But say you can only really average 3 new clients in the door a week? Well, you either earn half as much (6/3 = 0.5), or you have to double your fee to account for all the missed work. You can see this on the plot as the Fee x2 line. We don’t recommend this in general, and here is why. Flat fee billing minimizes financial risk for the therapist, because risk and reward are spread evenly among all clients. New therapists have a (justified) concern that they don't have enough experience to judge how long a client will take to heal, or even if they can help them at all. Unfortunately, failing to heal their higher fee clients has a big impact on income – small errors in your estimates and assumptions matter a lot more than with fixed fee billing. Thus, for many therapists variable fee contracts can be a financial nightmare. Worse, the estimated time based fees can get prohibitively expensive for the slower half of their client load – and the slowest would be paying two or three times your average rate. $300 is a lot – but $600 to $900 or more is a whole different level of pain for people who may already be struggling to pay bills. Many of these clients simply couldn’t afford it even if they have insurance. Therapists who are primarily specialists might consider variable fee billing, but their situation is different than a general therapist. Specialists usually set higher than average fees for their work; but since they can accumulate focused experience in predicting the duration of their treatments, it is also far easier for them to vary their prices to fit the client’s issue if they choose to. If you decide you want to explore using variable fees, we recommend you make yourself a guide of ‘standard times’ for the various problems you encounter; obviously, the general therapist would have a far harder time doing this than a specialist, although it is possible. Of course, with experience you can start to get a feel for client’s issues and how long they take, and work from your intuition – but if you do, we suggest keeping a close eye on your cumulative equivalent hourly rate! ‘Charging for results’ is all about ethical conduct and really living the golden rule – doing to others what you would have them do to you. This appendix has just shown you can do this while still making a living - you now know exactly how to charge the smallest fee to your clients while minimizing your financial risk and maximizing your income. In practice, you might bend the fixed-fee rules a bit but by this point you should have a good feel for the tradeoffs. For example, you might decide to charge less for some of the ‘easy’ clients and more for some of the ‘hard’ clients. Or go longer with a client you think is almost done, and shorter with a client you’ve figured out you can’t help (and need to pass on the a specialist or one of our clinics). Or you might reserve some of your time for charity clients, (a practice we encourage and do ourselves) by charging more than the minimum to cover these unpaid clients. Obviously, how you bill your clients is up to you and the constraints you have on your practice. One comment we’ve heard is that the therapist has a lot of insurance billing and can’t go to a ‘pay for results’ policy with them – but have you called and asked the company? After all, it is to the insurance company’s benefit to have you work this way! Or you might argue that you don’t have to change your billing because it is ‘illegal’ in the location you live in to give a guarantee. Sadly, we’ve had a number of therapist use this argument to avoid change; in fact the laws are written to handle the problem of ‘snake oil salesmen’ who offer cures that they can’t deliver. Not about charging for results. Although how a therapist charges is very personal – for example, some work for free, some only accept donations for their work – we actually encourage our therapists to charge a premium for our new, unique treatments (with a ‘pay for results’ policy, and no, the Institute does not get any of it). Why? Because we want this new paradigm to spread for the eventual benefit of all people. Introducing new ideas or treatments is very difficult even when there are no paradigm conflicts - for example, it took many years for experienced physicians to accept that ulcers were caused by a bacterial infection, even though it is quickly and easily demonstrated by treatment with tetracycline. Obviously, we hope that over time an altruistic desire to help their clients will make the subcellular psychobiology approach spread. But sadly, the reality is that a huge motivator in much of Western society is just simple self-interest. Thus, we hope to harness this motivation by having treatments that pay more, which we expect will cause people who normally would not use this material to adopt our approaches to their own work. As our models spread, this should in turn allow more people to get help, and give financial incentives for others to develop new treatments for other diseases and problems. And rather quickly bring down he cost to consumers as well as encourage its spread to the various state supported health systems. October 31, 2013: Slightly revised figures 10.1 and 10.2b. Updated the PDF to match. Sept 18, 2014: Put this appendix from the Subcellular Psychobiology Diagnosis Handbook online.